At RR Stone we pride ourselves on supplying quality products. When opening our bathroom showroom we were careful to only choose products that we believed to be of superior quality and Ashton & Bentley was a brand that we couldn’t say no to. But what makes Ashton & Bentley so brilliant? Read on to find out the 7 things that we think makes these products extra special. All Ashton & Bentley products are designed and made in England. As an innovative company, they use the latest Computer Aided Technology and materials to create their stunning products which are all individually finished by hand by their craftsmen. When you buy A&B, you are buying a product that honours Britain’s manufacturing heritage. A&B have created an exclusive material called Correro™. This material is a composite of organic limestone, white marble and resin. Not only does Correro™ look fantastic but it is also insulating so will keep your bath water warmer for longer. You’ll be able to squeeze in a few extra chapters of your book before getting chilly! There are a huge range of finishes for you to choose from. If you prefer the clean look of a white bath then you can choose between both matt and polished finishes. Both looks are stunning, though the matt finish can create a more unique statement. If you would love a metal bath but the insulating properties and weight are putting you off then an Ashton & Bentley bath will be the perfect option without you having to compromise. A beautiful metal finish – either copper, platinum or brass – is applied to the surface of the bath that gives you a strong, durable finish without the excessive weight of a solid metal bath. You can also choose a completely unique colour and either have the colour applied in the factory or paint the bath yourself if you would like the colour to match your decor… the options are endless! 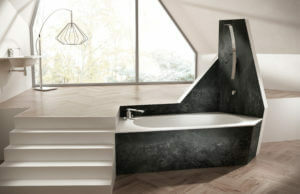 The Organic Techni range offers you the option to modify the bath to suit your style and/or the shape of your room. This modern range also features a ripple textured finish that is sure to make your bath the showstopping piece in your bathroom. Take a look at the images below to see the kind of products you can create. 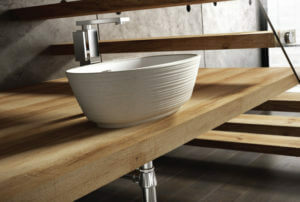 Ashton & Bentley also offer basins to go alongside their baths. 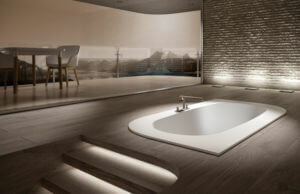 Made from the same beautiful material, they come in a range of shapes to compliment the baths. Though they are equally as lovely on their own in a cloakroom or shower room. Ashton & Bentley baths are repairable. Due to the nature of Correro, most scratches can be buffed and polished out. This is great news as you know you can keep your investment in great condition. Which brings us on to our final reason to love Ashton & Bentley…. 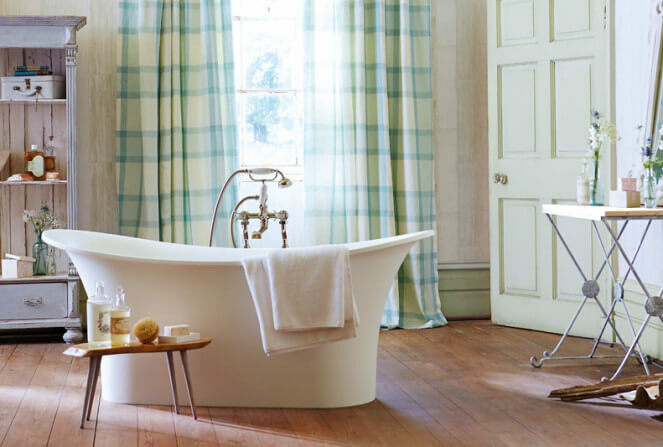 Ashton & Bentley baths come with a 25 year guarantee. These baths are built to last and A&B are happy to back this up with an impressively long guarantee. Why not come and visit us in our showroom to see the products first hand. Our sales team are here to help you. Alternatively you can contact us for some more information.